Healing Earth-- NOT "Losing Earth"
Last Sunday, the New York Times gave climate activists and the Earth what seemed to be a wonderful gift. The entire issue of the New York Times Magazine was devoted to a single article entitled "Losing Earth." It reported on the decade between 1979 and 1989 when, it said, the climate crisis could have been averted because scientists and many politicians of diverse outlooks were ready to act to prevent the worsening of CO2 emissions. But what the Times giveth, the Times taketh away. The article blamed the failure of that nascent climate-healing effort on the entire human race, which it said is so mired in the present urgency of many many issues that it is unable to think about the deeper future. So the article has the effect of disempowering climate activism, by saying the human species can’t see far enough to make a difference and that we are already cooked – literally. Earth is already lost. “Human short-sightedness” is in fact not the real problem, as I am in a position to know. And though we have lost a lot of precious time and many precious liveswe are not yet cooked beyond healing. Why do I say that I am in a position to know that the article misses the point? Because I was from 1978 to 1980 – the start of the decade mourned by the Times -- involved in the effort to pursue renewable energy in order to prevent "global warming" through the profligate burning of coal and oil. I was working together with Leonard Rodberg, a physicist and a colleague of mine in the Public Resource Center (a center for progressive thought and action in Washington DC). We worked on a study and report to President Carter's Department of Energy on the possibilities of community-based generation and use of solar energy. We said that this would be important to do precisely because the continuing use of fossil fuels was beginning to endanger the planet by heating it to levels that would disturb the entire web of life. So the Department of Energy gave us a grant to explore the social and technological possibility for this kind of community involvement in shifting to solar energy. We submitted a report that described what needed to be done. The Department was excited and invited us to propose the next step -- a grant that would make it possible for us to actually undertake and oversee a pilot project in community-based solarization. We submitted the proposal they invited, and they signed off on a contract to do it. Hallelu-YAH! But then came the election of 1980. Ronald Reagan was the nominee to oppose President Carter. "The Department of Energy has a multibillion-dollar budget, in excess of $10 billion," Reagan said during an election debate with Carter. "It hasn't produced a quart of oil or a lump of coal or anything else in the line of energy." When the new administration took power in January 1981, we went to the new set of officials in the Department of Energy with our signed contract in hand and asked them how to proceed. They laughed. They were not interested in replacing coal and oil with renewable sources of energy. We pointed out that the contract came from the US government, not from a particular administration. They laughed again. They were Big Coal, Big Oil. Why would they want to be replaced? To save the Earth and humanity from devastation? Hardly. We consulted some friendly lawyers knowledgeable about the ins and outs of the federal government. They told us we could sue, and perhaps in three years a court would decide to enforce the contract. And perhaps not. By 1986, the Reagan administration had gutted the research and development budgets for renewable energy and had eliminated tax breaks for the deployment of wind and solar technologies. And the Reagan administration capped its policy change with a symbolic change: Where Carter had installed solar panels on the White House roof, Reagan dismantled them. What actually made the difference to Mother Earth was the influence of Big Oil and Big Coal in Reagan’s mind and in the Reagan Administration. Money. Big money. “The fault, dear fellow-citizens, was not in our stars or in our genes, but in ourselves, that we are underlings." We allowed ourselves to be treated as underlings by the Corporate Climate Pharaohs that have flooded our planet with scorching heat and our politics with cash. And despite the NYT article, the earth is not yet lost. It is true that we have lost an entire generation of time while CO2 emissions have worsened and the Carbon Pharaohs have gotten even richer, even more able to buy scientists and politicians and the media. It is true that the task of healing is even harder. That now we need to think about ways not only of getting to Zero Emissions but also of withdrawing a trillion tons of CO2 from the air where the Carbon Pharaohs have happily emplaced it, chortling all the way to the bank. But we have learned some lessons that are important. Crucial. We have learned that a small cabal of scientists and politicians, no matter how smart and well-placed they are, cannot outdo the Carbon Pharaohs. Not in the 1980s, not even in 2009 when Obama was President and tried to work “inside the Beltway” to get a climate-protection bill passed by Congress. It failed. Not even in the twilight years of his Administration, with the Clean Power regulatory initiative that he still was trying to carry out by fiat without rousing a movement to demand it. Within months, he was replaced in the White House with a rabidly anti-Earth, pro-Carbon, pro-subjugation President. It is true that “Without a Vision, the People perish.” It is even more true that “Without the People, the Vision perishes.” We know now that it takes not even a climate-concerned President or presidential candidate, Democrat or Republican, to defeat the Carbon Pharaohs when Congress and the Executive Branch regulators are drenched with Carbon money in campaign contributions and lobbyist favors. The difference is not between Republicans and Democrats. It is between a hyper-wealthy Corporate oligarchy and a movement that opposes subjugation not only of the Earth but of all insurgent energies. A movement in the streets, the courts, and the voting booths. 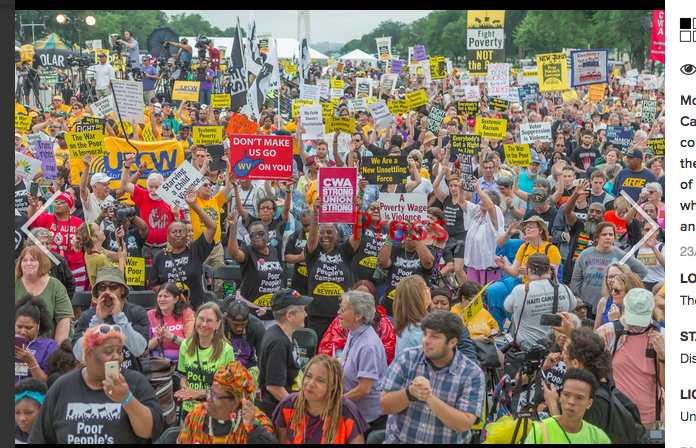 A multi-issue “fusion” movement based on a moral revival with a strong element of religious commitment -– as the Poor People’s campaign calls it and organizes it -- against subjugation, to heal the Earth and human civilization. A movement against subjugation of the Earth, of women, of Blacks and Muslims and Latinos, of the poor of all colors and locales, of the independent press, of children ripped from their parents’ arms while their parents are desperately seeking refuge from murderous violence. A movement that can acknowledge that almost all of us are addicted to oil because the whole society has been structured that way by the Carbon Pharaohs, and also know that just as nicotine addicts could rise up and force the Drug Lords of Tobacco to accept regulation, so can networks of Oiloholics Not-So-Anonymous recognize our own imprisonment in choking clouds of CO2 –- and end them. When the New York Times is proclaiming in its loudest voice that the climate crisis is real but no longer a crisis with choices – we have already lost our planet –- how do we summon up the will to persist and heal her? We need to know that it takes not only resistance to subjugation but affirmation of a joyful future, a Vision, to transform our economy and make the Carbon Pharaohs into simple citizens again. That vision must include a program for healing our climate, our planet, not just a plan for staving off utter catastrophe while region after region burns like California, drowns like Bangla Desh and Florida. And it will take the emergence of more people who at the grass roots can organically organize, resist, sing, dance, learn, cook, eat, register to vote, together. Not only the future but the present must be filled with joy. At the grass roots and in the grass-roofed Sukkah, the fragile hut to celebrate the Harvest of food, of wisdom, of caring for the Interbreathing that keeps all life alive. We need to remember that our most creative transformations emerged out of struggles against the worst tyrannies. From resistance to the overweening despotic empires of Egypt and Babylonia came the flawed break-through we know as Torah. From resistance to the despotic Roman Empire came the flawed break-throughs we know as Rabbinic Judaism and Christianity. From resistance to the power elite of Mecca came the flawed break-through of Islam. And so on! Those transformations sought not only a remaking of the political and economic systems of their time but also a profound sense that the Interbreathing Spirit of all life necessitated a profound reassessment of what is the good society. That in and with the Spirit, joy and self-restraint can join, and call forth energies that will outdo their opposite -- overpowering greed, the never satisfied drive for subjugation. Those energies, that movement have already begun. Like the great break-throughs of old, it is emerging in response and resistance to the most blatant effort at subjugation in our own country right now. It is already drawing on ecology, both as a science of the biological world and as an ecological attunement in understanding human societies; on the wisdom of indigenous peoples as encoded in the Hebrew Scriptures and in the powerful and attractive Native presence at Standing Rock; on the wisdom of nonviolent movements in the United States and other nations (especially in the 1960s); and on the best insights of democratic socialism. The Shalom Center grows out of the belief that not only the Jewish past and present but also the religious communities of all sorts and flavors can make a fusion of the joyful present and the joyful future happen. That the sleepy, yawning giant of the Spirit can be awakened for our good. “Chadesh yamenu k’kedem – Make new our days as they were long ago,” as the end of the Book of Lamentations calls on us to do after experiencing the worst of subjugations. Not to give us back “the good old days” but to fill our own days with newness, as they were when we humans saw far enough, deep enough, to change the world. Your frustration with the Times piece is understandable. But you fail to grasp the major takeaway from it. It will take a gigantic shift in consciousness on the part of a critical mass of the earth’s inhabitants for us not to go down in flames. Demonizing politicians or oil oligarchs is pretty useless. The only useful approach is to delineate the path leading to a shift in consciousness, the necessary steps that are needed to conquer our cultural, economic and political addiction to fossil fuels. Your article unfortunately doesn’t add much light to this very real challenge.